You girls probably already saw that I wore this outfit to afternoon tea at Ladurée in LA. 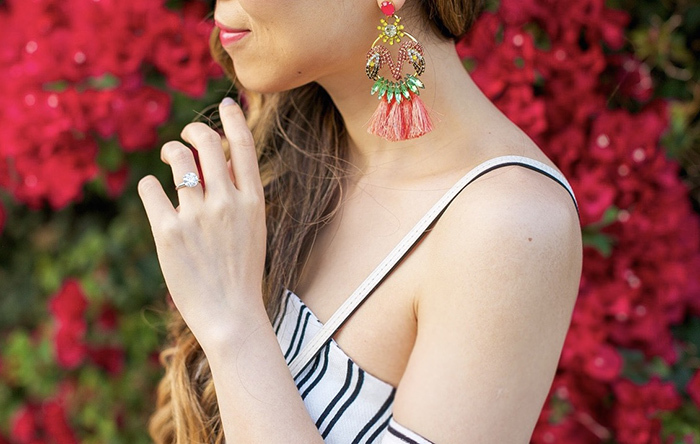 Not only this super pretty stripe off shoulder dress, but also these Elizabeth and cole earrings. They look bigger and more beautiful in person than the pic online. I'm madly in love. BTW, my bag was just restocked in this color and the stock is going fast!! You know what to do! I want to remind you girls that the biggest sale of the year, Nordstrom Anniversary Sale, is right around the corner. It’s the sale where we get to shop for new fall pieces on sale and the prices go up right after the sale. You girls know how much I love Nsale. If you have a Nordstrom credit card or debit card, you get to shop the sale from July 13th to 20th earlier than everyone else. For this kind of sale you want to shop early rather than later because popular items always go so fast and you will not be able to find your size if you wait. You can sign up for the credit card or debit card here in order to start early.